Pizza. I said it and you got hungry, right? My two older kids love it, but if we eat pizza, it's always made at home. My youngest is dairy free and ordering a cheeseless slice is too hard sometimes. Pizza Pockets are a new fun way for us to eat pizza as a family and they're a great opportunity for us to customize our toppings, or fillings, as it were. The end result is a dish full of pull-apart pizza magic! It's hands-on fun for the family, and if you're a fan of the DIY meals like we are, you'll want to add this to your list. These are great for packing in those lunchboxes too, and so easy to add to the LaLa Lunchbox food library! 1. Preheat the oven to 425 F. Line a baking dish with parchment paper and brush with olive oil. Roll our your pizza dough on a floured surface until it's about 1/2 inch thick. Using a circle shaped cookie cutter, cut the dough into circles and set aside. 2. Add a spoon of sauce to the center of each dough circle. 3. Add your fillings. I sautéed sweet Italian sausage with kale, red onion and red bell peppers in advance but anything goes here! 4. Add cheese. Looks like a mini pizza! 5. Fold up the sides into a ball, give it a little twist and place it with the seam down into your baking dish. I've marked the dairy free ones with an oregano leaf on top. Brush the tops with olive oil. And the inside? Yummazing. These are easy to pull apart, delicious to eat and also great for lunchbox leftovers the next day! I had a magnificent morning! I love to run. I love when music is blasting at an inappropriate volume in my ear as I propel myself forward. I love knowing that the sweat is well earned. I have some of my most productive, clearest thoughts while I'm running and for me, running is a solo adventure. It's precious time by myself. it's inspiring to be surrounded by so many motivated people! Today, I ran the Oakley Mini 10K, the world's original women-only road race, to benefit the Leukemia Lymphoma Society, a cause near and dear to my heart. I joined over 7,800 other women, all of whom had dedicated their morning to completing 6.2 miles around New York's Central Park. It's an overwhelming feeling for me; though I'm dedicated and content to complete the run by myself, I'm inspired by the crowd. In fact, I felt a bit choked up with emotion during the first mile, as I saw women of all ages, stages and fitness levels, filled with determination. And here we all are, lucky enough to take in the beauty of Central Park on a fine Saturday morning. Thanks to the kindness and generosity of so many folks in my life, I raised over $18,000 for the Leukemia Lymphoma Society. Those funds will be used to fund research for new, life saving and life-improving drugs and for patient and family education and services. My team, Moms In Training, raised over $400,000 for today's event. This is a victory! The best part of the 10K? That was definitely when I saw my family at the finish line. Feeling so blessed today. The Union Square farmer's market is one of my favorite places to visit in the City. The people watching is out of sight: some folks stroll through (especially tourists, families and caregivers with young children) and others race through at breakneck speed (like those who work in restaurants and have to quickly get specific ingredients back to the kitchen). The people who come to Union Square to sell their foods are uniformly friendly and willing to answer any questions. For example, I spoke with a cheese monger about why his cheeses were not organic. His animals are not fed hormones ever but if an animal gets sick, it is given antibiotics to get well. During that time, the milk from that animal is never used in the production of cheese but because of the administration of antibiotics, his cheeses are not able to be labeled organic. 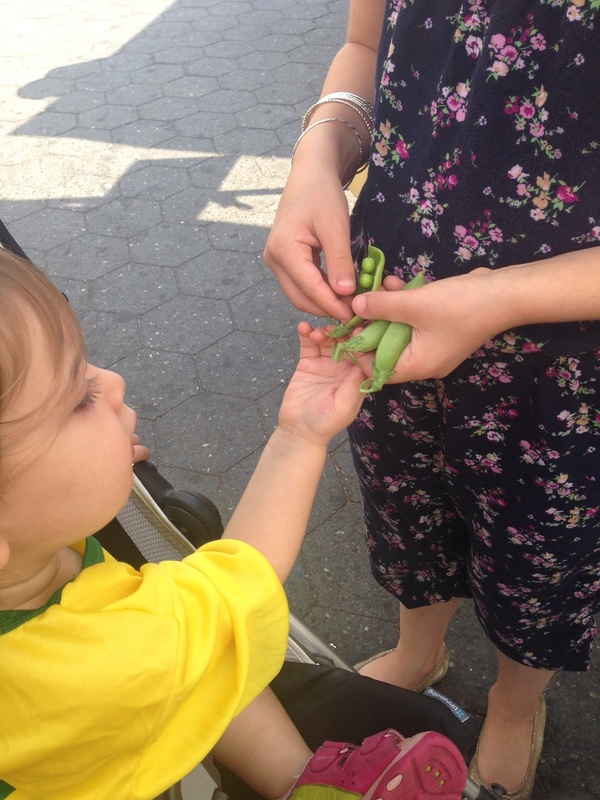 My kids love going to the farmer's market to see what's in season and to have little snacks along the way. On our most recent visit, the kids and I devoured over a pound of sugar snap peas and a pint of super sweet tiny strawberries. 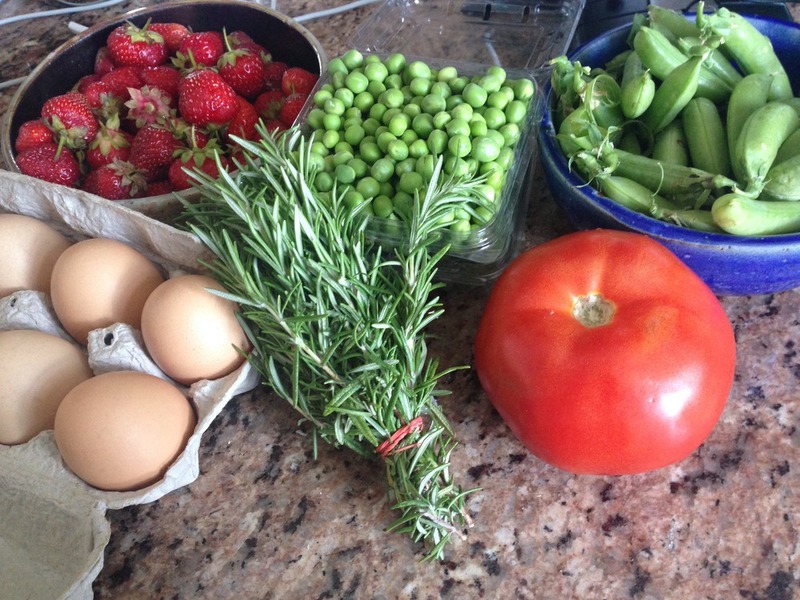 Here's just a small sampling of our farmer's market bounty. I'm going to use the rosemary later this week to season a white bean salad with roasted garlic. We'll fly through those eggs in a day or two (most likely scrambled) and the rest of the produce will be eaten raw. It's really hot outside today so I'm particularly excited to have fresh, wonderful foods that don't require my oven.